Heavens to Betsy! ...the exclamations of a small town girl: Happy L Day. I thought I'd share a bit of Cumbrian folklore with you for the day of love tomorrow. This heart shaped wood grows along side the motorway near Tebay and it always makes me smile and think about love whenever I see it. There are lots of tales about it's origins, some say it was planted as a memorial to a young soldier who was killed in the first world war, others say it was a farmers way of expressing his love for his wife. A lot of people think that it stems from 'star crossed lovers' from rival farming families who committed suicide. Some people also think that it represents the middle of mainland Britain. 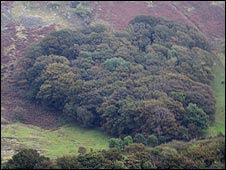 The woman who now owns the land claims, rather crushingly, that the heart shaped wood isn't actually heart shaped at all, and that is was originally a forest plantation set up in the mid 1800's, and that is all that is left of the original plantation. Whether it be man made or accidentally created by nature, I still like to think of it is as a grand romantic gesture created by someone or something.